To have an exposure on the Ceramics Industries environment of Bangladesh. To present an overview of Shinepukur Ceramics Ltd.
To identify the problem & suggest remedial measure for the development of Shinepukuer Ceramics Ltd.
To relate the theories of financial analysis with the practical activities. This report titled “Financial performance analysis and valuation of Shinepukuer Ceramic Ltd.” is an outcomes of BBA course of semester-VIII named “Internship Program”, BBA department of Dhaka City College assigns us at Shinepukur Ceramics Ltd. to introduce us so that we might get overall concept practical activities of ceramics sector. We have calculated and discussed of different ceramics sectors, such as ratio analysis, trend analysis, industry analysis, cross section analysis, risk analysis , common size analysis, statement analysis, sensitivity analysis etc. as it has been directed to present the report in a way of reflecting the understanding of the sectors which are present in our country. Qualitative methods are used to describe all the functions and mechanisms used to perform trade functions by using different information from their annual reports & others sources. Face to face conversations with the employees at various fields. Personal interviewing and interacting customers at Shinepukur Ceramics Ltd.
1. 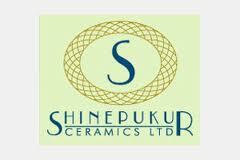 Internet and Annual report of Shinepukur CeramicsLtd. 2. Progress report/ Statement affairs and Academic sheet of the company. 3. Several kinds of Academic test-book and training sheet. 4. Prior research report on various Ceramics company. To prepare this report, standard method of report writing have been used for writing this report different types of data were needed to complete and analyze. The required data were collected by suing both primary and secondary source for collecting data from secondary source, company annual report articles, newspapers and other materials were used. After completion of the data these were sorted into different categories. Through the report these data were analyzed by using standard statistical methods. And on the basis of this analysis the findings of the report were made. Collection of Primary data were tough. So, I had to depend mostly on secondary sources. Due to time limitations many of the aspects could not be discussed in the present report. Every organization then secrecy that is not reveled to others. While collecting data i.e. interviewing the employees, they did not disclose may information for the sake of confidentiality of the organization. The clients were to busy to provide me much time for interview. The sample population is limited. Ceramics are widely used in industries for a range of purposes. Due to their high heat resistant properties and extreme durability, they can be used successfully in refractory, metallurgical, glassware, oil refinery and such other processes. Today industrial ceramic manufacture is a huge industry in itself and there are several multimillion dollar companies in the field, researching and producing industrial ceramics. The materials used in the production of industrial ceramics are different from those used in ceramic art forms. These materials need to be strong and durable and be able to withstand very high temperatures. The common materials used are oxides, carbides and nitrides of nonmetallic inorganic minerals. I. They should have a very low coefficient of thermal expansion so that they can withstand a high temperature. This low expansion also helps the ceramics to be manufactured without much error, or else there could be a dimension difference when the ceramic is cooling down after firing. II. They should have high melting points so that they can sustain the high temperatures used in most industrial processes. III. They should be insulating to electricity. IV. They should be insulating to heat. Industrial ceramics are made from nonmetallic mineral clays. The minerals are first taken in the right proportion to obtain all the required properties, and then they are crushed and ground into a very fine consistency. In order to remove impurities, purifying chemical solutions are added to the mixture. Any impurity is removed in the form of a precipitate. Then wax is added to minerals. Wax acts as a binder and it holds the clay together. Plastics could also be added in case the ceramic requires to be more tenacious and durable. Plastic also improves the pliability of the ceramic. When all the processes are accomplished, and the ceramic has got its shape, the materials are molded and heated for a second and final step. This final stage in the preparation of industrial ceramics is called ‘densification’. In general the manufacture of industrial ceramics is complicated and involves numerous processes using very specific and expensive production equipment. I. In fuel industry, industrial ceramics are used to manufacture proppants that are required for hydraulic fracturing process of oil wells and natural gas reserves. II. In electric appliances, industrial ceramics are used for glazing and insulation. Zirconium oxide is commonly used in manufacturing such industrial ceramics. III. In refractories, industrial ceramics are used to manufacture crucibles and various other objects that require a high heat resistance. For the same purpose, ceramics are also used in kilns, furnaces, glass manufacture and metallurgical operations. IV. Various electric fittings are made from aluminum oxide ceramics. Castings for fuse wires, holders of light bulbs, etc. are some of the areas where industrial ceramics are used. V. Industrial ceramics are used to manufacture filter slices which are used to filter out waste gases in industrial operations. VI. Zirconium ceramics are used to manufacture tips for circular knitting machines. VII. Industrial ceramics are used in manufacture of ovens and thermal storages in industry. Industrial ceramics are an important part of the day-to-day operations in any manufacturing process that involves heat and electricity. Though these may not be beautiful to look at, they are indispensable and highly useful to the industrial world. Life cycle models are not just a phenomenon of the life sciences. Industries experience a similar cycle of life. Just as a person is born, grows, matures, and eventually experiences decline and ultimately death, so too do industries. The stages are the same for all industries, yet industries cycle through the stages in various Lengths of time. Even within the same industry, various firms may be at different life different life cycle stages. 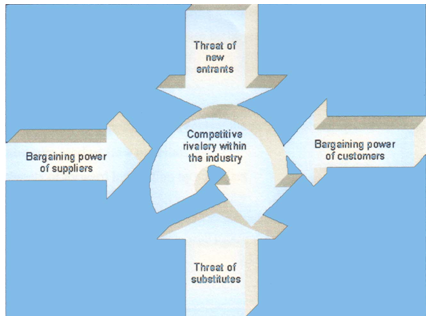 Strategies of a firm as well as of competitors vary depending on the stage of the life cycle. Some industries even find new uses for declining products, thus extending the life cycle. Others send products abroad in hopes of extending their life. Our Ceramics industry in Bangladesh is in Rapidly Accelerating Industry Growth Stage in industry life cycle. This stage starts when the product of the industry is accepted by the market. Further demand increases rapidly. The number of firms in the in the industry is limited at this stage and hence the firms can experience substantial backlogs of orders. Hence prices can be increased or discounts can be decreased and therefore profit margins are high. The capacity utilization goes up and even though productive capacity is increased, sales increase more rapidly. Hence high profit margins occur simultaneously with high sales growth, Profits explode. sales growth can be high up to even 50 percent year and profits can grow over 100 percent a year as a result of the low earnings base and high profit margins and increasing efficiency of the firms. Threats of new entrants is low because-Threats of new entrants: In this sector govt. gives different types of subsidies and relaxing laws and regulations which attract new firms to entire new firms to enter in this industry. Hard to have access to the distribution channels of excising companies. Bargaining power of buyer: As there are different substitute products, the buyers can exercise their bargaining power which may effects in case of setting price. Customers are fewer prices sensitive. Bargaining power of supplier: As our raw materials are supplied by different suppliers and we are highly depended on them, so, suppliers also have the bargaining power option which may effect on our sufficient amount of production level. Threats of substitute Products: As our products depends on customer sentiment and willingness to buy those and the existence of different substitute products, involves competition among the funds. Rivalry among the existing competitors: As under this industry there are many firms operating their business in the economy. So, there exists strong rivalry among the competitors. Industry is growing at a slow rate and yet to attain its best so supply gap is evident. Fixed costs are high which make it hard for exiting from the market. Strong capital based and technologically company is in operation and grabbing major market shares. 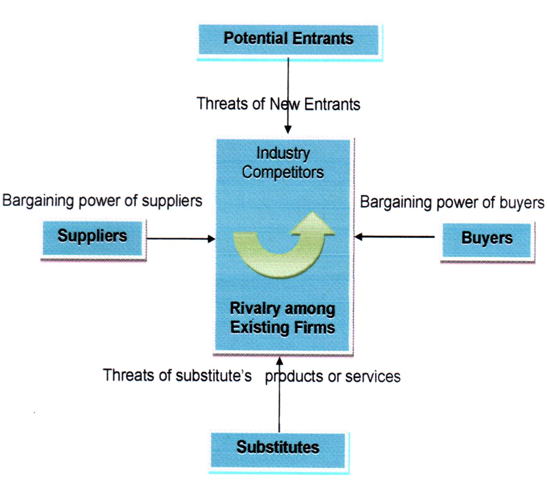 Porter’s concept of competitive strategy is described as search by a favorable competitive position in an industry. BUSINESS CYCLE & INDUSTRY SECTOR:Economic trends can and do affect industry performance. By identifying and monitoring key assumptions and variables, we can monitor the economy and gauge the implications of mew information on our economy, outlook & industry analysis. Most observers believe that-Industry Performance is related to the stage of the business cycle is different and those who look only at history miss the evolving trends that will determine future market performance.During a recession some industries do better than others. Consumers’ staples, such as-Pharmaceuticals, foods and beverages. Outperform other sectors during a recession because, although overall spending may decline, people still spend money on necessity So, these “defensive” industries generally maintain their values. Similarly, if a weak domestic economy causes a weak currency, industries with large export components to growing economics may benefit because, their goods become more cost competitive in overseas markets. As shinepukur ceramics Ltd. is considered as it is able to hold the position of peak in economic cycle. Generally, investors should not invest based upon the current economic environment because the efficient market has already incorporated current economic news into security prices. Rather, it is necessary to forecast important economic variables at least 3 to 6 months is the economics, consumer sentiment etc. which may affect different industry. a. Inflation:Higher Inflation is generally negative for the stock market, because, it causes higher market interest rate, it increase uncertainty about future prices & cost, and it harms firms that can not pass their cost increases on to consumers. Although these adverse effects are true for most industries, some industries benefit from inflation. Shinepukur ceramics Ltd. that has high operating leverage may benefit because, many of their costs are fixed in National terms where as, revenues increase with inflation. As Shinepukur ceramics Ltd. is an existing company in our economy, there has a negative impact of interest rate if it rises. Higher interest causes higher operating expenses which may reduce our profit margin. As we are producing export quality finished products, if we can create free trade zones in different countries it will broaden the market internationally and overall economic conditions will be developed. The study of demography includes much more than population growth and age distributions. Demographics also include the geographical distribution of people, the changing ethnics mix in a society and changes in a society and changes in income distribution. Trends in technology can affect numerous industry factors including the product or service and how it is produced and delivers. As new technologies are innovated, we are able to increase our productivity and reduce our delivery time and increase our profit margin. Because political change reflects social values, today’s social trend may be tomorrow laws, regulations or tax. The industry and assess political changes relevant to the industry. Regulatory changes have affected numerous industries also. Regulations and laws affect international commerce, international tax, laws, tariff, quotas, embargo and other trade barriers different industries and global commerce in various ways. Shinepukur Ceramics Limited (SCL / the company) was incorporated in Bangladesh on 26 January 1997 under the Companies Act, 1994 as a Private Limited Company and commenced its manufacturing operation in 1999. The Company was converted to a Public Limited Company on 7 May 2008, The Shares of the Company have been listed in the Dhaka Stock Exchange (DSE) and Chittagong Stock Exchange (CSE) on 18 November 2008 under the DSE and CSE Direct Listing Regulations 2006. The registered office of the company is located at House No.17, Road No, Dhanmondi R/A, Dhaka. The industrial units are located at Sarabo of Gazipur. The company operates in a single industry segment. It is engaged in manufacturing and marketing of high quality Porcelain and high values added Bone China Tableware, which it sells in the local as well as international markets. Comparative information has been disclosed for all numerical information in the financial statements and also the narrative and descriptive information where it is relevant for understanding of the current year’s financial statements. Comparative figures have been re-arranged wherever considered necessary to ensure better comparability with the current year without causing any impact on the profit and value of assets and liabilities as reported in the financial statements. Shinepukur Ceramics is a member of the Largest Private Sector Conglomerate, BEXIMCO, in Bangladesh with about 30,000 people in the permanent payroll, handling a diversified range of merchandise to and from Bangladesh. The Group’s in-house manufacturing interests encompass Seafood, Jute Yarn, Pharmaceuticals, Textiles, Knit, Denim, Garments, Real Estate and Engineering. BEXIMCO is also involved in Media, Computers and the IT Arena’s. As part of a meticulously planned expansion program of the Group, BEXIMCO has setup this state-of-the-art Ceramic Tableware Plant, SHINEPUKUR CERAMICS LTD. (SCL) on the outskirts of Dhaka in 1999. SCL is a 100% export oriented unit, equipped with the latest and modern Machinery’s and Kiln’s from TAKASAGO MINO, and SKK Japan and comprises of two independent units producing high quality Porcelain and Bone China Tableware. The Porcelain unit has a capacity of 60,000 pieces, whilst the capacity of the Bone China unit being 10,000 pieces a day. The Bone China unit has in fact been setup on the basis of the latest technology from NIKKO Japan, coupled with extensive training facilities to our Production team, both locally and internationally. Since commencement of the commercial production at the end of 1999, Shinepukur has successfully developed a substantial export market for the top-of-the-line Bone China and Porcelain Tableware and the customer portfolio now includes world-renowned Tableware companies in the UK, USA, Spain, Italy, Australia, New Zealand, Norway, Sweden, Russia, UAE, Denmark, Germany, France, Mexico, Turkey, and India. Decal Plant and Design Studio: Decal production started in August 2001. Total Printing Capacity is about 120,000 Sheets per Month, starting from single color upto 8 Colors with Gold/Platinum, both On glaze (840 degrees Celsius) and In glaze (1220 degrees Celsius), and completely Lead and Cadmium Free. The Company has set up Designing Studio in the Plant in 2005 and in Italy with Rody Time s.r.l. in 2006. Packaging Plant: Production in the Packaging Plant started in June 2003. Assorted about 300,000 Pieces White and/or Brown Cartons per month are presently being produced in this facility. In addition, the Company also supplies 4-6 Color Printed Cartons. Exports from Shinepukur Ceramics comprise about 60% of the National Tableware Export turnover of Bangladesh. As recognition of this contribution, SCL has been awarded National Export Trophy (Gold) in December 2003 for the Financial Year 2000-2001and 2002-2003. Each of our activities must benefit and add value to the common wealth of our society. We firmly believe that, in the final analysis we are accountable to each of the constituents with whom we interact; namely: our employees, our customers, our business associates, our fellow citizens and our shareholders. To sustain a significant sales growth above industry average. To develop employee skills through training. To establish as one of the most preferred Ceramics Company in Bangladesh. To assure quality products from our manufacturing facilities. In order to achieve our aspired vision we shall subscribe to the following values. Transparent and fair in all our dealing. Take initiative to exceed standard. Live up to our commitment. Mrs. Umarova Patimat E.G. Caracatsanis & Co. Ltd.
6, Ainianos str. , GR 10434 Athens, Greece. In a major expansion move, Shinepukur Ceramics Ltd (SPCL), a fully export oriented subsidiary of Beximco Group, in January 18, 2009 signed an MOU with a German company for setting up an expansion unit of bone china. Mr. Nazmul Hassan Chairman Shinepukur Ceramics Ltd (SPCL) and Konrad Schmidling,Managing Director of Ceramic Info Center, Germany signed the agreement at Beximco Corporate Headquarter in Dhaka. The MOU aims at supply erection and Commissioning of SPCL’s bone china expansion unit to be set up at Beximco Industrial Park having a capacity of 4.5MT per day. The Expansion Will increase production capacity to the Tune of 150 percent over present bone china Production capacity. The expansion project will be completed By October 2009 at an estimated cost of Tk 80 crore which will entirely be financed by Bangladesh Export Import Co. Ltd. (BEXIMCO), the parent company of SPCL. Once the expansion project is completed additional export sales of Tk 110 crores and net profit of Tk 20 crores is expected. Shinepukur Ceramics is the single Largest Exporter of ceramic tableware of Bangladesh and contributing around 50 percent of the total export of tableware from Bangladesh. Shinepukur Ceramics Ltd, equipped with the state of the art machineries, has two independent units producing high quality Porcelain, Alumina Hotel Ware, Ivory China and Bone China Tableware. The Porcelain unit has a Capacity of 65,000 pieces. Since commencement of commercial production at the end of 1999, Shinepukur has successfully developed a substantial export market for the top of the line Bone China and Porcelain Tableware and the customer portfolio now includes world-renowned Tableware companies in the UK, USA, Spain, Italy, Australia, New Zealand, Norway, Sweden, Russia, UAE, Denmark, Germany, France, Mexico and Turkey. SCL produces variety and wide range of Bone China and Porcelain Tableware for Retail as well as Hotel (Service Industry), and Ivory China for Retail Houseware, having over 75 Shapes and 600 Desings. Most of the new Shapes of Bone China and/or Porcelain can also be developed and produced at the Plant within 8 weeks. Starting from 5 Pcs Place Setting to 20 Pcs Dinner Set and 95 Pcs Full Service Sets to variety of Gift Items, every Ceramic Table-top is supplied from Shinepuker. Heavy metal release Testing–Compliance within the Lead & Cadmium release. The brilliant on-glaze decoration makes Bone China Tableware special. Shinepukur’s lightweight Bone China is thermal shock and chip-resistant making it practical as well as beautiful for the Formal Table. The brilliant whiteness of the translucent body gives the colors a great luminosity and vividness, impossible on any other Tabletop. The Company mow offers about 100 Shapes and over 400 designs; from classical gold rim to trendy floral and geometric Decals. As the latest venture of the most successful Corporate Group of the Country, (BEXIMCO, since 1965), Shinepukur is blazing the trail in ceramic tableware manufacturing in Bangladesh. The Company offers ar exquisite range of the finest, world-class tableware in Bone China. Shinepukur culminates all its knowledge, skill, efforts, and traditions in superbly crafted Tableware demanded by discerning customers. Incorporate on January 26th 1997, Shinepukur is set on 35 Acres of land at the Beximco Industrial Park at Gazipur, about 35 kilometers north of Dhaka. The plant was commissioned on December 9, 1999. This export-oriented company has a production capacity about 1600 Tons of Bone China per Annum. The glaze of Shinepukur Porcelain is unique and peerless, a dexterous preparation of the most experience and professional ceramic technologists in the region. Perhaps the best white Porcelain, exceptionally translucent and crystalline. Shinepukur pioneers in applying microwave-proof gold, a state-the-art user-friendly technology, and edge decoration of tableware. Patterns with such decoration can be used it microwave oven safely. The Porcelain Unit has capacity to produce about 5250 tons per Annum. 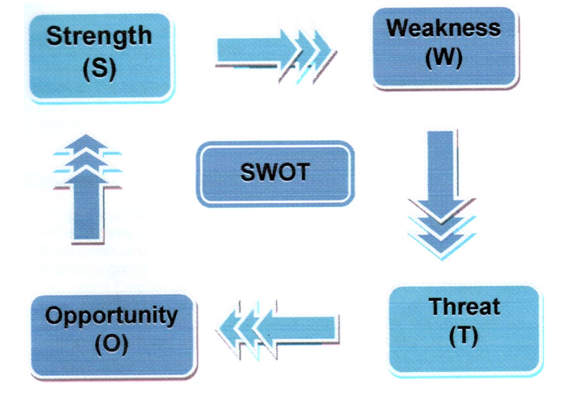 This section identifies the main strength, weakness, opportunities and threats associated with the shinepukur Ceramics Ltd. It involves monitoring the internal (Strength & weakness) and external (opportunities and threats) marketing environment. Supplier has ultimate control over the material market. Government initiative an incentive in this sector is very in sufficient. Luck of technological Development that offset the productivity & other activities in whole value chain. Large potential domestic & international market. Markets are gradually shifting towards quality products. Interposed disposable income & purchasing power of foreign customer open new market development. Competition from other developing countries. To balance the demand & supply. To make balance between price & quantity. Lower per changing power of Bangladeshi customer. Corporate Head quarter : 17, Dhanmondi R/A, Road No.- 2, Dhaka- 1205, Bangladesh. Our products are largely affected by changes in consumer sentiment any consumer willingness and ability to borrow & spend money.